The pubic fat pad area can best be described as the zone of your pelvis where the anterior (front) pubic hairs normally grow. This area can cause an unsightly bulge, commonly seen when wearing tight clothing, bathing suits, or underwear. Some patients seek liposculpture because of complaints of excessive “jiggliness” in their pubic area. 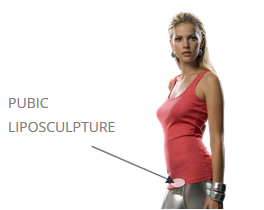 This area can cause concern after undergoing a tummy tuck or abdominal liposuction procedure – since the new flattened stomach contour after a tummy tuck or abdominal liposuction may draw more attention to the bulging pubic fat pad area (more common in overweight patients). HOW DO I KNOW IF I AM A GOOD CANDIDATE FOR PUBIC FAT LIPO? 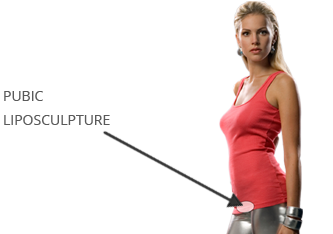 If you are self conscious about the bulging appearance of your anterior (front) pubic hair area, then you may be a candidate for liposculpture of this zone. Both men and women complain of bulging fat in this area. If you have had previous abdominal liposuction or a tummy tuck procedure, then you may benefit from sculpting the pubic fat pad itself. Dr. Hayduke prefers to perform pubic fat pad liposculpture in the office under local anesthesia. Two tiny skin access sites are made through which ultra small sized cannulas are inserted to suction the bulging fat. Absorbent pads are placed over the pubic area and changed twice per day for the first two days. A compressive binder is worn for one week. Tylenol is used for soreness, which is generally quite mild. Work can be resumed the next day. Bruising resolves over a two week period. Sexual activity can be resumed after one week.